Honestly, it’s getting a little ridiculous. Maybe I’m old school, but don’t all these words really mean the same thing? Isn’t this just retail? Sure, it’s a more modern version of retail, and has more of a tech bent or is tech-enabled, but it’s retail just the same. That’s why I called my event series Retail X Series. One way or another, it’s all about retail. Long live retail! What is retail today? After all the dire warnings of the “retail apocalypse,” store closings, zombie malls and retail bankruptcies, “retail” is a loaded term. But in reality, retail is changing – and the definition of the very word “retail” is no longer what it was. Startups in what I call the “retail sector” can be B2B or B2C. They can be marketplaces or ecommerce sites. They can be digitally native brands or fashion brands. They can be technology companies that sell into enterprise (legacy) retailers like Walmart, or they can be fashion tech companies that provide products and services for fashion brands. They can be apps or sharing/rental platforms. They can be companies that provide tech services for small and medium sized bricks and mortar retailers, or platforms for influencers that are launching their own ecommerce presence. In short, the definition of retail is expanding. And the challenges for these companies are very specific to the sector. Retail, in every shape or form, requires a knowledge of how shoppers shop and buy. Of the specific seasonality and sales cycle that is unique to this sector. Of the legacy of promotional calendars and wholesale models. 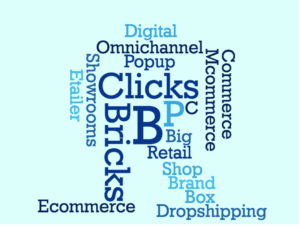 Of bricks and mortar versus online versus mobile. And marketing – both online and offline. I’ve said in previous posts that I’m looking to invest in the future of retail. But I also want to help build it. And as I looked around at the growing retail ecosystem of New York, I realized that while there are some great incubators and accelerators locally targeting the sector, there are fewer resources for entrepreneurs who are just starting out in these sectors. That was the genesis for Retail X Series, which is launching on September 19th. What is it? It’s a retail startup boot camp program for pre-seed stage founders who are revolutionizing the future of retail. We’re hosting twice monthly events with experts covering topics from customer acquisition, to financial modeling, to seed stage fundraising, targeted specifically to B2B and B2C retail founders. Featuring great panelists who have been there, and actionable insights for early stage founders. No equity taken, no commitment to attend all sessions. I’m incredibly excited to launch soon, and if you’re a pre-seed retail founder, I hope you can join me. Over the last few years, we’ve seen dozens of startups tackling the problem of fit in women’s apparel. * Whether it’s creating a better/custom fit or understanding how a product will fit the shopper, it’s a big space. And no wonder as poor fit is one of the biggest causes of online apparel returns (on average, the return rate in women’s apparel ranges between 30-40%). Since online returns are costly for both retailers and brands, there is a big opportunity here. But for all its promise, solving the women’s wear fit issue is a really tough nut to crack. There are too many barriers to list here, not the least of which is that designers create sizes based on their own fit models (and sometimes change them on a seasonal basis!) so even if you know the shopper’s exact measurements, it’s still really hard to match that to a size. But one of the biggest barriers I see is that most of these fit solutions require shopper behavior to change, and in some cases, to change dramatically. And that causes friction in the user experience. For example, scanning your body before you get a product recommendation is not easy and requires a scanner to be nearby. Taking measurements is difficult, and can be a lengthy process. Filling out a long survey before shopping is annoying. All of these are barriers to shopping online, and put the onus on shoppers, instead of solving the problem on the back end, which likely lowers conversion. What does that mean for fit tech going forward? My guess is that body scanning and taking shopper measurements isn’t going to be the answer. Maybe it will be something that is simple as snapping a selfie. Or using machine learning to understand your fit preference over time. Or something completely new. I haven’t seen the winning solution in fit tech yet, but I’m looking for it. *Interestingly, fit seems like a slightly easier problem to solve in menswear, for a variety of reasons. First, you don’t have one-piece garments like dresses that have to fit properly all over the body. Two, styles aren’t as varied, as men’s clothing is more of a “uniform” than women’s. 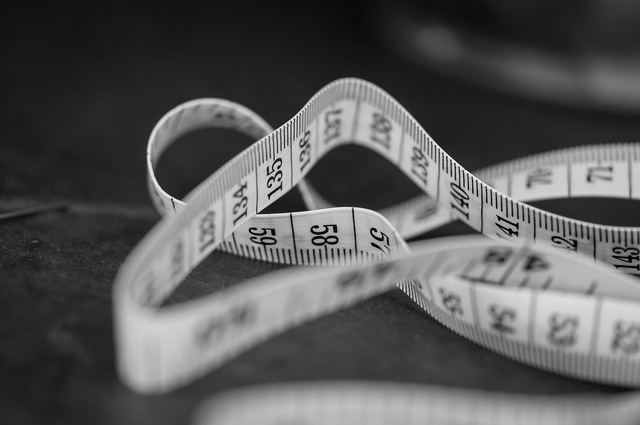 Three, men’s clothing has historically been based on measurements (inseam, neck size, sleeve length), so men are more familiar with measuring themselves and knowing their measurements. So custom and semi-custom brands like Indochino, Threadlab and Stantt seem to work better in this space, and technologies like ClothesHorse and Fittery have seen some traction. Retail AI-powered chatbots are relatively new for most retailers and brands, but chatbot fever is here. There’s a lot of excitement around the technology, but most agree, it’s still early days for chatbots. Basic customer service – including easy queries like what are your store hours, where are the men’s shirts in the store, do you carry black skinny jeans, was my order was delivered? 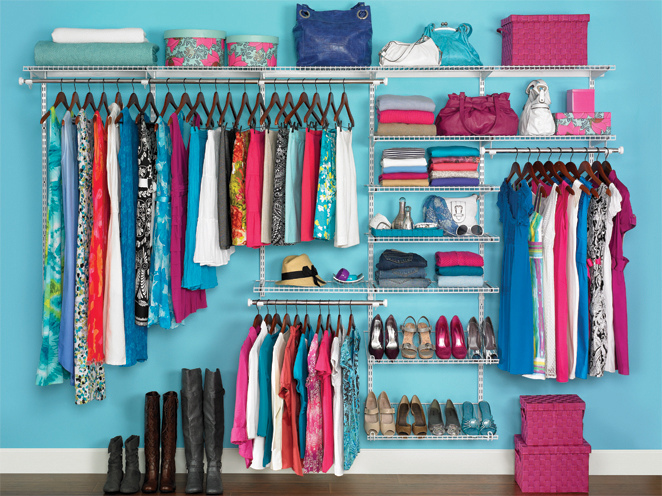 Fashion collections – these include viewing of collections, sometimes gamified. A great example of this was the Burberry chatbot for Fashion Week 2016, which created a “maze” for their collection’s inspiration. Trusted advice – Getting styling advice from a bot that feels like a real stylist. Example: I have this printed top. What should I wear with it? This is really hard, but could be incredibly useful in increasing mobile purchasing. Discovery – What is cool and trending right now in fashion? Example: The bot sends back personalized recommendations of summer tops with bell sleeves. Many of these will require some human help, especially in the early days. Shopper feedback – using chatbots to gain customer insights for product development (versus boring old customer surveys). Example: Do you prefer one printed dress over another? Startups like Claire, Bowtie, Operator, Banter, and AddStructure are building chatbot products for commerce. I’m sure there are plenty of others out there that I haven’t seen yet. Do you have chatbot fever? Are you working on a retail chatbot startup? I’d love to hear from you. I recently wrote about the massive shifts in the retail landscape we’re going to be seeing over the next 5-20 years. Many of the changes we’ll see will be focused on disrupting legacy systems and processes, recreating the supply chain and making logistics even easier and faster. All of these are worthy initiatives, and I may end up investing in startups that do these things to transform retail. But right now, I’m looking for the fun, specifically the joy of discovery. I’m looking for companies/technologies that bring the joy of discovery back to the shopping experience. Do you remember when shopping used to be fun? You would go to a mall, store or urban center. You would browse around, see interesting stores with unique product and merchandising that had a point of view (remember when Banana Republic sold safari clothing in the 80s?). You’d find something that you fell in love with and just had to have. It was fun – and it was a process of discovery. You didn’t necessarily know what you would buy when you left home in the morning, but you were excited to see what was out there. And ecommerce? 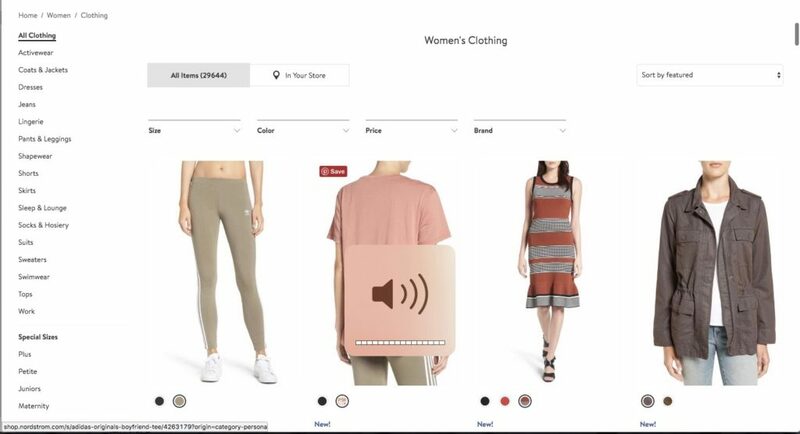 It’s just an infinite scroll of product, and it works best when you have a specific item in mind that you’re searching for, not when you’re “just browsing.” Here’s an example: if you click on Women’s Clothing at Nordstrom.com, you get a list of almost 30,000 items. That is not browsing and discovery, that is torture. I’m seeing more and more ecommerce and mobile sites adding lifestyle images or “trend” sections to make discovery a bit easier, but it’s just not enough. There are a few glimmers of hope. Chatbots are being used to help you discover new items. 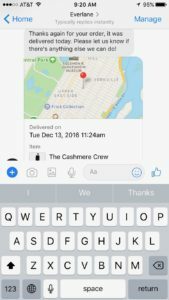 Reply Yes* has created a conversational commerce platform that focuses on helping you discover new items in particular categories via Messenger or SMS. Other startups are tackling discovery by making social media and published content more shoppable – and taking discovery off of the actual shopping platforms. But I’m looking for even more creative solutions to this huge problem. Are you a startup founder working on bringing back the fun and discovery in retail? I’d like to hear from you. *I’m an investor in Reply Yes. Over the last few months, the headlines have been dire: Stores are dead. Malls are dead. Chain stores are dead. Retail is dead. Ecommerce is dead. Millennials are looking for experiences, not more stuff. Younger consumers prefer to rent, not buy clothing, accessories, etc. Amazon is eating retail. Ecommerce is unprofitable. Mobile commerce is… well, you get the idea. While clickbait headlines scream gloom and doom about the future of retail, I just can’t believe that most or even much of a $5.5 trillion dollar industry is just going away. I refuse to believe that future generations won’t shop in physical locations or that all ecommerce will be done on just a handful of marketplace sites (e.g., Amazon or Walmart/Jet). Instead, I think that we are seeing a massive shift in what shopping means – and we’re at the very early part of that shift where stores/malls are closing, where ecommerce startups are shuttering or getting bought out at low valuations. And that makes it hard to be an optimist about the industry. But I am. So what’s next for retail? Is it tech like chatbots, machine learning and AI? Hyper personalization? Drone delivery and instant gratification? Is it digitally native brands that do one thing extremely well? Is it disrupting the supply chain and making manufacturing easier, cheaper, more local and more environmentally friendly? Is it pop-ups and temporary space instead of stores with long leases? Or all of the above and more? It’s early days to say what retail will look like in 10, 15 or 20 years. But I’m still actively investing in retail tech and ecommerce because change is coming and I want to be a part of it. I’ve been fascinated by the luxury space for a while now, and have been looking to invest in a luxury startup. Obviously, there have been a few notable successes in luxury ecommerce, including Net-a-Porter, Moda Operandi and Yoox, to name a few. But overall, the luxury space has been slower to adopt technology and create compelling online experiences that meet or exceed their offline store experiences. My personal take is that it’s still early days for luxury, and we’re just now seeing luxury brands starting to maximize ecommerce, mobile and social buying. Luxury apparel and accessories brands have built their own ecommerce experiences, but participating with full price aggregators (Net-a-Porter, Neiman Marcus, Moda Operandi, as well as newer players like Orchard Mile) has been critical to brand building. I found it interesting that fine jewelry hasn’t gotten the same attention from luxury online aggregators. Why? Because it turns out that fine jewelry is a hard business and very different from luxury fashion. It is a huge industry ($264b annually) made up of a few brands that have huge marketing budgets (Tiffany, Cartier, etc.) but only make up 12% of the total. And the rest are independent local boutiques and sites. Not to mention that about 60% of fine jewelry purchases are gifts (think bridal, anniversaries, Mother’s Day, Valentine’s Day, birthdays and more). Online sites that currently sell fine jewelry like Net-a-Porter rarely appeal to the man buying a gift for a significant other. And buying an expensive jewelry gift is a very different purchase process than self-purchase of a handbag or a jacket. Which was why I was so intrigued when I met Jean Poh, founder of Swoonery, last fall. Jean told me about how she was building an online fine jewelry aggregator that uses a guided shopping experience based on machine learning to help shoppers buy a gift or self-purchase. And since Swoonery doesn’t hold any inventory (which can be the kiss of death for high price point items like fine jewelry), the business model made a lot of sense to me. When she told me about her vision, I was hooked and made an investment pre-launch. Swoonery launched on Sunday and I can’t wait to see how it shakes up the fine jewelry market. Check out the site at www.swoonery.com and let me know what you think. 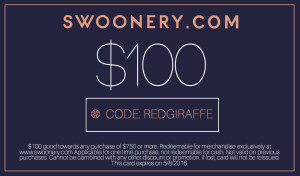 And btw, Jean was kind enough to share a discount code, in case you’re tempted – check it out below. And on and on. So who’s right? Clearly, social media and friend’s recommendations impact e-commerce as well as bricks & mortar shopping. Content (particularly that of style influencers, bloggers and celebrities) does help shoppers to make choices about what to buy and what trends are important – and we’re seeing more and more of these influencers develop their own product to sell, as well as curate from existing product. And more and more shopping is done via mobile, so I think everyone would agree that mobile is big. Lastly, with the Internet allowing proliferation of products and brands, it’s hard shoppers to find what they’re looking for – so increasingly sophisticated and targeted search and discovery tools will be needed. But maybe it’s more than those things. Maybe it’s about shoppers who become sellers as well. I read about Poshmark today – the company is now seeing about 20% of their users turn into legitimate sellers (selling more than the items from their own closet). Or maybe it’s about the maker movement – a trend that uses advances in technology to allow everyone to create new products – which creates new retailers at the same time. Or maybe most commerce goes away and it all becomes about the sharing economy. We don’t know yet how this will all shake out – or which startups and segments will ultimately win, and for which segments of the population (well, at least I don’t know). But in an increasingly commerce-obsessed startup world, I think for now, I’m going to say that everything is (or could become) the new commerce. You’ve heard ad nauseam about the Apple Watch over the last week. The features, the function, and probably most of all, the design. Many think it’s stylish, some don’t (see here, here and here). Yes, the Apple Watch is lauded by men, who find it both functional and stylish, but will women embrace it? And if so, which women? Let’s rewind to about five years ago. In the luxury market, oversized/boyfriend watches hit the market – this Chanel watch alone was featured heavily in press and ads, and ultimately sparked a slew of similar styles from competitors. 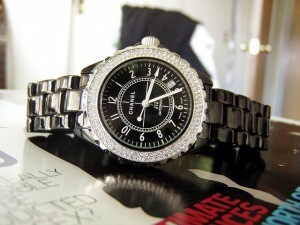 Suddenly, watches were new again – not only a great Father’s Day gift, but an essential fashion accessory for women. And women of all ages responded by collecting watches as they do handbags or shoes – in a variety of styles, sizes and colors. While luxury designer watches like Chanel were featured in fashion magazines, it was the affordable yet aspirational brands like Michael Kors and Marc Jacobs, among others, that became de rigueur for millennials and Gen X. 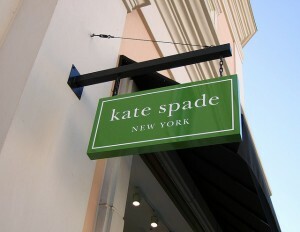 By 2012, with strong success in the category, lifestyle brands (Kate Spade,etc.) and traditional watch brands (Fossil, etc.) responded with new offerings and styles, from rose gold and mixed metals, to various face styles (oval, round, square), bracelet/strap styles and even sizes (dainty watches recently made a comeback). Suddenly there were watches that fit every style and budget – from millennials to Boomers. By 2013, many fashion-conscious women owned a “watch wardrobe,” changing their watch daily, they way they change their handbag or shoes. Fast forward to today. Apple introduces the Apple Watch, with three styles (Apple Watch, Sport and Edition), two sizes and a plethora of customizable options – from colorful straps to rose gold. That’s a good thing, since watches have become a critical fashion accessory for women. But is it enough? It’s a good bet that the Sport versions will likely appeal to young, millennial women – they’re young enough to have missed the Swatch watch and G-Shock crazes in the 80s and 90s, and the tech features will appeal to them. Cost may be an issue for many (the Apple Watch starts at $349) but millennials have been shown to spend on technology even when budgets are tight. The more fashion-forward and expensive rose gold and gold versions will no doubt appeal to women in the global fashion industry. In fact, I would expect to see this version prominently featured Fashion Week street style images, in the press, worn by fashion bloggers, etc. But I believe that for Gen X and Boomer women, the Apple Watch is probably less appealing – particularly after they’ve created their watch wardrobes over the last five years and aren’t looking for yet another one, no matter what features it offers. So what’s my take? Well, the short answer is that the Apple Watch is probably right for some women (millennials, high fashion), but not nearly all – at least, not yet. 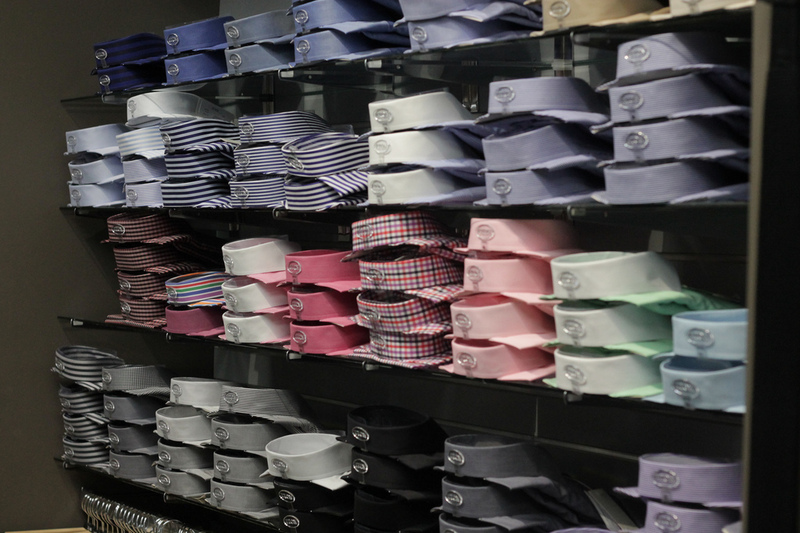 It’s been all about menswear for the last few years, as the US menswear market has been growing faster than the women’s market, both in stores and increasingly online. Mall-based retailers like J. Crew, Nordstrom, Lululemon, Coach and Lord & Taylor and more have beefed up their menswear sections to respond to increased demand for interesting and new viewpoints on menswear. Newly launched wholesale brands like Public School, Shinola and AXS Folk Technology are getting a lot of buzz, and the hype around many of these new brands is significant (Shinola was picked up by Nordstrom and Public School won the CFDA/Vogue competition). Even men’s underwear has been a growth category, growing 4% over the last 12 months. And don’t forget luxury designers: brands like Prada have announced a renewed focus on menswear, as have Bruno Cucinnelli and Bergdorf Goodman – the list goes on and on. Online, menswear e-commerce stalwarts like Bonobos, Mr. Porter, Jack Threads, Revolve Clothing and Need Supply have been successfully growing their businesses. Conventional wisdom says that at some point, menswear growth has to slow and the industry will consolidate, particularly as the lines between e-commerce and bricks and mortar begin to blur. Pundits predict continued growth in the overall men’s category, currently projected to exceed $402 billion globally in 2014, which is good news for men’s e-commerce. 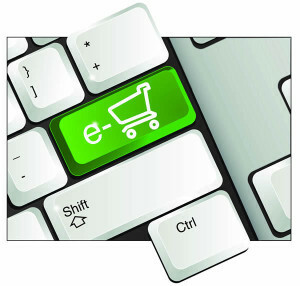 In fact, in just the last 12-18 months, there has been a real explosion of new e-commerce concepts and brands. Some examples? Wits and Beaux, which, like many menswear sites, focuses on a very narrow category, in this case ties and socks. Others target a specific lifestyle like Hickoree’s, which embodies the Brooklyn hipster feel. Others focus on fit, using bespoke and made-to measure techniques, like Trumaker or Acustom. And then of course there is East Dane (owned by Amazon), offering every better and contemporary brand under the sun. There is even a new luxury watch rental site for men, Eleven James, based on the Rent the Runway model. Which begs the question: is men’s e-commerce over? Have we hit the peak? How many more new concepts can the market really support? The answer is not yet clear, but if I had to bet, I would say we will see plenty of new menswear sites before all is said and done. It hasn’t been an auspicious start to the Spring selling season. One after another, middle-of-the-road chain retailers have described the environment as “difficult,” blaming weather, the economy and competitive price pressures. With the exception of high-end designer/luxury brands, the message has been the same – retailers are not particularly optimistic about the first half of the year. It’s true that unusually cold and snowy weather has hampered the early spring selling season and the economy is still struggling (particularly at the lower end). But I believe a big part of the issue right now is a real lack of new spring fashion trends represented in stores – in fact, it feels like most retailers are playing it safe. During a recent mall visit, most stores didn’t feel very “springy” as color palettes across the mall were neutrals like beige, black & white and some navy. After a few seasons of bright colors, neons and colorblocking, this spring’s looks feel pretty blah – so it’s no wonder women aren’t buying them. It’s not there aren’t fashion trends this season, it’s just that they are micro trends with more segmented appeal. Some of the key runway trends for spring fashion include: pastel colors (especially pink), flare skirts, high-waisted pants, crop tops, sheer pieces, active inspiration, overalls, floral prints and metallics. While most of these trends are represented at high-end luxury/designer stores, few of them are visible at women’s apparel retailers like Ann Taylor, Gap, Banana Republic, Express and even Nordstrom. Or they are a very small portion of the assortment, with basics and neutrals overshadowing the newness. For many of these retailers, certain of these micro trends are difficult to interpret for their specific customer base – e.g., can Banana Republic sell a crop top to a 40 year-old woman? And unlike previous seasons, there is no one overarching new fashion trend that every retailer has bought into (note: for the last few years the overarching trend has been bright colors, inescapable throughout the mall and clearly conveying to the customer that it was time to buy color). Even at teen or millennial focused brands, the current trends seem tough for retailers to interpret. Even typically edgier retailers like Urban Outfitters are struggling. However, the current micro trends should actually appeal more to these younger, edgier customers – so perhaps it’s just the retailers that are having trouble identifying and sourcing the right items featuring the right trends? It’s tough to say why retailers are struggling with spring fashion trends this season. But one thing seems clear – since retailers don’t have a strong fashion point of view for the season, it’s much more difficult to get shoppers in the buying mood. examples and details). For now at least, the uber-wealthy aren’t balking at ever-higher prices for designer handbags, shoes, watches, jewelry and even apparel. 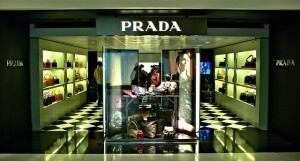 However, many aspirational shoppers that used to be able to splurge on a Prada bag every so often have been finding it much more difficult to do so. While aspirational shoppers are probably not particularly happy with the status quo, there is one group that is benefiting – contemporary brands. Over a decade ago, brands that fit in the spot between “better” and “designer” were called “bridge” brands, but with the rise in designer brands, many of those bridge brands lost relevance and customers. But as designer brands started to rise in price (while the biggest price increases have been in the last five years, most designer items are significantly more expensive than they were around 2000), bridge brands came back – but with a new name: they are now “contemporary” brands. Today, contemporary brands are an alternative to higher priced luxury designer brands, particularly in the accessories sector. Let’s take the handbag category as an example. Instead of buying a $2,000+ bag by Chanel, Hermes, Prada or Gucci, shoppers can now more affordably splurge on Tory Burch, Marc by Marc Jacobs or Kate Spade at less than $1,000. Other brands that benefit from higher luxury prices? Some big ones that are reaching up into the contemporary space including Michael Kors and Coach and even smaller, growing brands like Rafe, Longchamp, Rebecca Minkoff and Pour La Victoire. Contemporary brands recognize the opportunity to lure shoppers to a more affordable, yet still aspirational form of luxury. Michael Kors, Kate Spade and Coach have all recently announced growth initiatives to capture more of this growing market in the handbag, shoe and accessory space. And it’s not just the contemporary brands seeing the potential in this space. Some designers are using their diffusion lines (e.g., Red Valentino, B by Brian Atwood) to take advantage of the contemporary market as well. Luxury price increases show no signs of slowing in the near future, which bodes well for aspirational contemporary brands – in accessories, apparel and more. There’s a new look for spring and it’s a hybrid of fashion and activewear (sporty fashion? fashionable activewear?) and it is officially everywhere. It started with sporty looks all over the runways for Spring Fashion Week, continued with active/fashion hybrid looks at retail stores and entire “sporty” sections on traditional women’s websites like J. Crew – which include traditional activewear items like yoga pants paired with classic pieces like blazers. Even Nordstrom has gotten into the act: check out this recent email from Nordstrom which features fashion items that walk the line between active and fashion. A recent visit to Intermix featured windows that highlighted sporty/fashion crossover looks and fabrications that are typically seen on activewear (like mesh) sprinkled throughout contemporary brands (see image below). But it’s not just women’s apparel brands that have started to blur the lines between active and fashion. Traditional activewear retailers have gotten into the act as well. Recently, Lululemon launched its &Go line that features activewear that doubles as street clothes, with some early success. Adidas is also seeing strong results not only with the resurgence of Stan Smith footwear styles (particularly during Fashion Week), but also its Stella McCartney collaboration. None of this should be surprising as activewear has gotten more and more ubiquitous over the last five years (see this post for more details). From teens to moms, women have been wearing their activewear for more than just working out or going to the gym. The new twist that for spring is that these hybrid looks are not quite for working out and not quite dressy, but a blend of both, which means they can be worn really almost all the time. And that means that women can choose to shop a traditional apparel retailer to buy their spring looks or they can choose an activewear brand, making competition for spring wardrobe dollars even more intense. While this spring’s fusion of fashion and activewear is a seasonal trend, we’ll be watching to see if women embrace it – which could have implications for the way women dress not just this spring, but in the seasons beyond. Remember the good old days when store windows were a primary marketing vehicle and traffic driver? Store windows included mannequins, props, signage, visual imagery – all to create a lifestyle brand feel, and transport the shopper into the world of the that particular brand. Barneys NY became particularly noted for their windows, and the holiday windows in major cities like New York were a tourist attraction (and still are, to some extent). 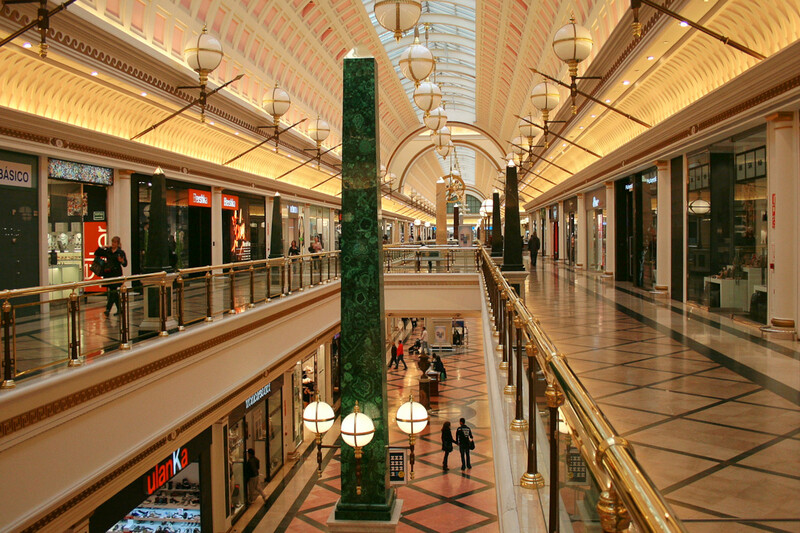 However, as the recession forced stores to cut costs and payroll, only flagship stores received all the trimmings of elaborate window displays. Other stores had to depend on visual banners and a few mannequins. 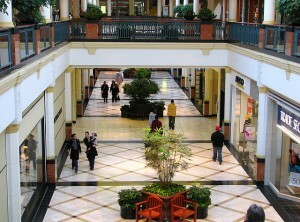 At the same time, mall traffic saw declines – even the last holiday season showed a 15% decline in shopper foot traffic. With fewer people at the mall and fewer elaborate displays or the store payroll to maintain them, store windows have become less important. Enter Pinterest. A few savvy retailers have figured out that Pinterest strategies can take the place of store windows (and catalogs, and even some traditional advertising). The best Pinterest boards create a lifestyle that is relevant to both the brand and its target shopper, and create the aspirational brand feel online. Who’s doing this well? 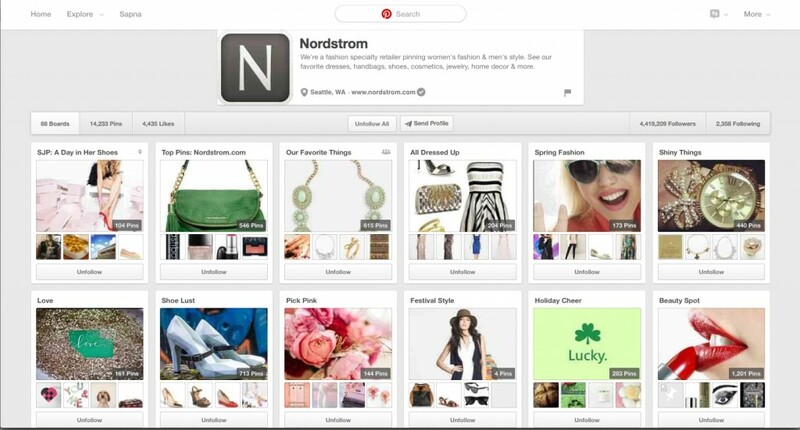 By a wide margin, Nordstrom, with over 4.4 million Pinterest followers is winning in the fashion space. 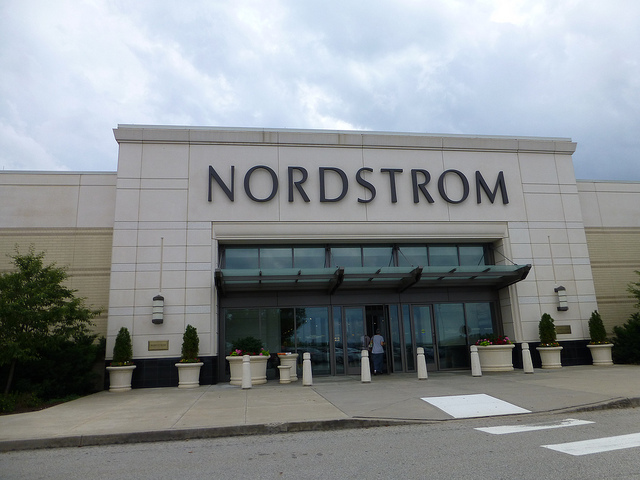 With 66 boards featuring product images, how-to’s, trends, wedding ideas and travel images, Nordstrom creates an aspirational, luxurious feel on all its boards that isn’t just about selling items but developing the brand. And it’s not just fashion brands that have been able to build big followings – Lowe’s is another retailer that has taken advantage of the DIY and home-related interest in Pinterest boards to develop a following of over 3.5 million people. While aspirational brands are usually thought of as most suited for Pinterest given their high quality images, it’s not just the higher end brands that are utilizing Pinterest boards to gain large followings – Forever 21, the fast fashion teen retailer, ranks higher than Tory Burch (see chart below). But most major retail brands have not done enough to make Pinterest a key part of their marketing and brand strategies. And if they don’t take advantage of Pinterest, they face a windowless future. Want to know more about Pinterest strategies employed by major retailers including Nordstrom’s in-store Pinterest initiative? Contact us or leave a comment below. Note: As of 3/15/14. Methodology includes primary account followers. Does not include ancillary accounts. A few years ago, experiential retailing was touted as the answer for bricks and mortar stores to compete with online retailers. Some high profile examples like Terrain (the garden/café/store concept owned by Urban Outfitters), Metropark (a clothing chain with DJs spinning during the weekends) and REI (sporting good retailer offering climbing walls in-store, among other activities) were billed as the new future of retail – and a way to beat the ease and convenience of e-commerce. But in the past few years, the hoopla around experiential retailing has taken a back seat to more of-the-moment buzzwords including mobile and omnichannel. Nordstrom launched a cocktail bar in its Bellevue store. Sure they’ve always had a café and coffee bar in most stores, but not a true cocktail bar. Habitant launched in July as a test, and Nordstrom may roll the concept out to more stores in the future. Restoration Hardware recently revised its store designs and included a wine bar, pub and billiard room in its new Boston flagship store. These and other non-retail elements are being added to other stores as well as more of the new format stores are rolled out. Urban Outfitters is launching a new concept store in Williamsburg area of Brooklyn, featuring a variety of pop-up shops, apparel and a restaurant and bar with rooftop dining. 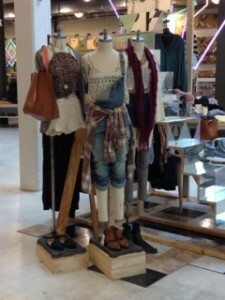 Slated to open in winter 2014, the multi-floor store will be a new addition to the Urban Outfitters portfolio of brands. It remains to be seen if these types of add-ons to the traditional retail store will result in sustained improvement in store traffic and revenues (for other ideas on how stores can compete, see here). But at least bricks and mortar retailers are not going down without a fight. Do you remember the days that teens used to come to the mall not only on weekends, but after school? It’s hard to believe but true – up until about 2008, American teens regularly came to the mall, armed with a parent’s credit card or cash. They would hang out, shop, eat and watch movies with their friends. Then came the recession. Parents took back the credit cards and cut back on spending even for key seasons like back-to-school. Many teens were unable to get summer or part-time employment so they didn’t have any of their own cash to spend. Not surprisingly, teen retailers like Aeropostale, American Eagle, Abercrombie & Fitch and Hollister struggled. At the same time, teens started using social media to be, well, social. Instagram, Snapchat, Facebook, Twitter and more became the way teens communicated instead of hanging out at the mall after school or on weekends. And there were plenty of fashion blogs, new e-commerce retailers and fashion sites like Polyvore to browse without leaving home. Suddenly, it just wasn’t as important to physically be at the mall. Fast forward to today. Those teens that ditched the mall? Well, they’re in their 20’s now and they’re still not going to the mall that often – a recent study found that even now, they are hitting the mall once per month. Let’s face it, this generation is just not a bunch of mall rats. All those years of going online to be social and browsing online has had its impact – millennials still find other ways to shop and browse. And why not? Online millennials can browse and buy from the e-commerce sites of traditional retailers as well as those with no to limited store presence like Nastygal, Modcloth, Madewell and more. So will millennials actually ever go back to the mall in the way that malls are hoping? Sure they’ll go when they need to try something on, or to see a movie, or for dinner. And malls aren’t giving up on them by any means. But it’s doubtful that malls will get this generation of 80 million young people to think of the mall the way previous generations did. And that spells trouble for the mall. In the 1980s it was leotards and legwarmers. In the 1990s, it was running gear. But for the past 10 or so years, it’s been yoga pants. Ah…yoga pants. Those ubiquitous black stretchy pants paired with a moisture-wicking tank or hoodie. In fact, the explosion of yoga and yoga pants launched a slew of women’s activewear brands and retailers in the US: Lululemon, Athleta, Sweaty Betty, VSX by Victoria’s Secret…the list goes on and on. The yoga boom also energized the big names in the activewear space – major brands like Under Armour and Nike launched highly successful yoga lines, as did Gap with its GapFit brand. Even kid’s retailers like The Children’s Place began offering yoga pants. If you are a retailer in the yoga business, it has been a great run for a long time. But now things are changing – not that activewear is going away. Actually, the women’s activewear market grew 9% in 2013 and is expected to keep growing at a similar rate in the years ahead. But the key is that it’s not only about yoga anymore. It’s about activewear appropriate for a variety of activities. Newer fitness trends including spinning, CrossFit, bodyweight training, HIIT (high-intensity interval training) and more are expanding the market for women’s activewear. And accordingly, brands and retailers are taking notice. Reebok is now the official activewear sponsor for CrossFit, Soul Cycle has launched its own line of spinning-related apparel, and Nike has made running a primary focus at its retail stores. Both Under Armour and Nike have also made the women’s activewear business a key growth focus for the years ahead. Even Target recently re-launched C9 by Champion to be a full-fledged activewear brand. What does that mean for retailers in the activewear space for 2014? It’s a great niche to be in – as long as they remember that it’s not just about the black yoga pants.